Amazon.com Inc. (NASDAQ:AMZN) and Whole Foods Market (NASDAQ:WFM) have announced a number of changes that will come with the closing of their merger. Amazon’s $13.7 billion acquisition of Whole Foods will close on Monday August 28, 2017. After the merger, the company will maintain operations under the Whole Foods Market brand and its headquarters will stay in Austin, Texas. John Mackey will remain as Whole Foods Market’s CEO. However, Amazon will waste no time putting its stamp on Whole Foods. The companies plan to start by lowering prices for everyone on many key grocery items after the deal closes. The price reductions will start with items such as chicken, eggs, some vegetables, and some types of organic fish. The companies did not say how steep the reductions would be. Amazon Lockers will soon be available for products shipped from Amazon.com in select Whole Foods Market stores. Customers will also be able to send returns back to Amazon during a trip to Whole Foods. 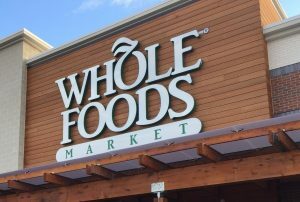 Whole Foods’ private label products, including 365 Everyday Value, Whole Foods Market, Whole Paws, and Whole Catch, will soon be available on Amazon.com, AmazonFresh, Prime Pantry, and Prime Now. Amazon also plans to begin selling its Echo and Echo Dot Alexa-powered speakers in select Whole Foods location. Mackey said, “By working together with Amazon and integrating in several key areas, we can lower prices and double down on that mission and reach more people with Whole Foods Market’s high-quality, natural and organic food.” Wilke commented, “There is significant work and opportunity ahead, and we’re thrilled to get started.” A time frame for all of the changes has not yet been disclosed. The announcements had a considerable effect on the stock prices of grocery competitors. Walmart’s stock price dropped 2 percent on the news, while Target’s dropped 3 percent. Kroger and Supervalu stock prices fell more than 7 percent and 4 percent, respectively.